Cinnamon is one of my favourite kitchen cupboard herbs. With a multitude of uses and a rich, sweet and pungent flavour, it’s no wonder it’s so popular in culinary and medicinal recipes. The cinnamon we commonly find in the supermarket is Cinnamomum zeylanicum, or Ceylon cinnamon, which is native to Sri Lanka as the name implies. There are several varieties of cinnamon used in cookery but the other type most widely used medicinally is Cinnamomum cassia. This is a stronger and more pungent variety native to China and is usually what will be referred to as cinnamon in any Traditional Chinese Medicine texts. The inner bark is most often used but the twigs also have a place in TCM with slightly different indications. C. zeylanicum is the only variety I have worked with medicinally and, though it is sweeter and milder than cassia, I have found it to be a great ally in healing a wide variety of ailments. The use of cinnamon stretches back further than history. It was imported to Egypt around 2000 BCE and is mentioned several times in the Bible. Offered to kings and Gods it was once worth more than silver and colonial powers expended many lives and resources attempting to gain a monopoly on it. How fortunate we are now to have such easy access to cinnamon that we can all be Goddesses and Kings in our own kitchens! Stimulating, warming, pungent, aromatic and sweet it is an ideal remedy for this time of year to help get us through the last of the cold weather, boost the circulation and raise the spirits. It’s commonly added to hot drinks for the treatment of colds and flus, not just for its warming and diaphoretic qualities but for its potent antibacterial and antiviral activity as well. It also has some anti- fungal properties and some herbalists recommend its use in the treatment of gut dysbiosis, or an imbalance of gut flora, symptoms of which may include bloating, gas and colic. This makes sense to me because these afflictions often occur where there is a lack of ‘digestive fire’ which cinnamon most certainly helps to boost. In layman’s terms this means that the digestion is weak and food is not properly broken down encouraging opportunistic bacteria and fungi to flourish in the gut and compromise the balance of healthy bacteria. Cinnamon not only enhances digestion and absorption but stimulates the appetite and calms nausea. Being astringent due to its high tannin content, it has been traditionally used as a gentle remedy for diarrhoea in children and the elderly. Cinnamomum zeylanicum. Image courtesy of Wikipedia. 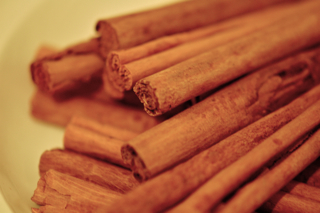 Aside from its benefits for digestive health cinnamon is a prime remedy for the respiratory system. When I take cinnamon tincture it is in the lungs that I first and most strongly feel its effects as it immediately opens the chest and deepens breathing. This is in part due to the high volatile oil content which lends cinnamon its aromatic qualities. It is most useful for moist, phlegmy coughs where it has an expectorant action and helps dry mucus. I have also found it useful where there is shortness of breath due to tension and stress as it gently relaxes and expands the lungs allowing for deeper breathing to occur. An essential oil is made from cinnamon which I particularly enjoy in the oil burner (it’s lovely mixed with orange or tangerine) though it’s really too potent for use on the skin. Cinnamon has gained fame recently for its ability to help maintain stable blood sugar levels making it useful in insulin resistance and type II diabetes. Studies have shown it can significantly help to lower glucose levels in the blood due to its insulin potentiating effects. It is no coincidence then that cinnamon has traditionally been used in sweet desserts as it not only tastes delicious but also helps balance our blood sugars after such indulgences! One of my favourite ways to enjoy the balancing effects of cinnamon is in this lovely tea which I like to drink during that mid afternoon slump when many of us suffer from a lull in our blood sugar levels. 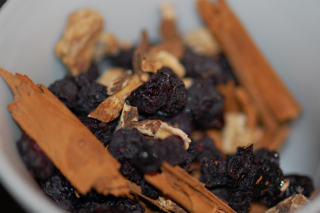 It contains a heaped teaspoon of bilberries, a heaped teaspoon of burdock root and one stick of cinnamon broken into pieces. The herbs are decocted or simmered gently in enough water for two mugs worth and then strained and drunk. All three have been used to balance blood sugar and the tea is surprisingly sweet and delicious in itself. I also like to capitalise on the digestive properties of cinnamon by making an infused vinegar of cinnamon, cardamon and bay leaves. This can be easily done by adding equal quantities of each herb to a jar with a plastic lid (vinegar erodes metal) then covering in apple cider vinegar and leaving to infuse for a month. These three herbs are used together in many Ayurvedic formulas for improving the digestion and are collectively known as the ‘Three Aromatics’. Infusing them in vinegar seemed to me a good way of incorporating them into my diet on a daily basis as it can be used freely on salads and veggies or taken in warm water with a little honey. As the great Hippocrates said, ‘let food be thy medicine’. I also like to make a cinnamon tincture for use in individual formulas. This one was made in 45% alcohol, 1 part herb to 4 parts liquid but it would be very simple to make via the folk method which simply involves filling a jar with broken cinnamon quills, covering it in vodka and leaving to infuse for 2 weeks if you want more of the aromatic qualities or 4 weeks if you want a more astringent tincture for use in diarrhoea or heavy menstrual flow. Of course you can also use powdered cinnamon freely in food and drinks. It’s delicious on porridge, in smoothies or mixed into a paste with a little raw honey to make a healthier version of cinnamon toast. Hey, if its good enough for royalty then it’s good enough for me! Great article, laden with information. Thank you…had to do an annex card in my materia medica just for this aritcle. Have you ever read, In Barbara Grigg’s “Green Witch Herbal” she cites from the British Pharmaceutical Codex of 1911, Dr. Fernie’s “Kitchen Physic” 1901, and Dr. Valnet as all using cinnamon (tincture) to treat influenza (must be administered within 24 hrs of onset.) I’ve tried this in one case of influenza and this person was up and about, rather to my astonishment on the third day. That’s great, thanks for sharing your experience. I don’t have Barbara Grigg’s Green Witch Herbal, I feel another trip to Amazon coming on! I have some lovely cinnamon tincture at the moment so I’ll be sure to experiment next time anyone near me looks sickly. Just love your spice articles! Ummm I’m just imagining you baking something sweet and Cinnamony, the smell is almost wafting across the ocean and into my living room. They’d make wonderful oatcakes, a natural pairing I think, we’ll have to give it a go. Does your daughter find it helpful? Has she noticed a difference in her blood sugar levels? 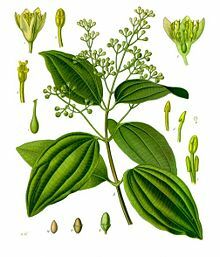 When I was young and had heavy bleeding and cramps a decotion of a stick cinnamon and a bay leaf helped me very much to stop the cramps. Funny is that it doesn’t matter how much you take from one herb, but it is important to combine them to get the helpful effect. Many thanks and big herbal hug! You have left me with a lovely image of you and the children baking through clouds of cinnamon, it makes me want to be a child once more too! That’s interesting that you had such success with the cinnamon and bay decoction for cramps, I will have to try that out. What a treasury of information freely given! Thank you for sharing this with us. Cinnamon is one of my favourite spices for cooking but I didn’t know much about its medicinal properties. 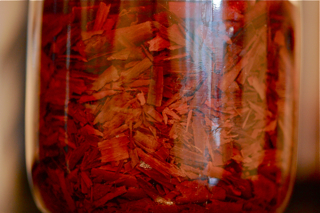 Cinnamon vodka – I mean tincture! – sounds fabulous as well as useful. Last September I tried adding cinnamon to the oaty topping of pear and elderberry crumbles – the earthiness of the elderberries and cinnamon seemed to go very well together, lightened by the sweetness of the pears. 1) The tea blend sounds delicious can’t wait to try it! Were do you get your dried bilberries? I can’t find any locally. If you get them local to you can I get you to send me some and I’ll send you a cheque pretty please? 2) In your Three Aromatics Vinegar, do you use fresh or dried Bay leaves? I ask because I have a huge bay shrub outside the front door and I prefer the scent of fresh bay to dried. I made tincture with the fresh bay leaves last year which got used in a gardeners hand cream blend and some was used in a recipe for making my better half some aftershave. So I got my bilberries fromTree Harvest I think but you can also get them from Cotswold or All Organic Trading. The only problem is that you’d have to get a kilo from the later two companies which works out quite expensive (£30 something). You can eat them too though so you will get through them. I’ll need to order some more in a month or so so if you can hang on till then we could go halves on a kilo to save us both some pennies!! Neal’s Yard might sell them in smaller quantities, I’m not sure. As for the vinegar I used dried but only cos that was all I had. It’s funny that you posted this comment yesterday because I bought my first baby bay plant yesterday. When it grows up a little I will definitely do it from fresh, would be much nicer i reckon. I like the idea for the aftershave! Thank you so for your wonderful – most interesting and helpful – blog! On the cinnamon page I would find it helpful if you added a note re the high coumarin level in Cassia Cinnamon, which led to health warnings in many countries. It is for example widely used in most Christmas biscuits, as it is much cheaper than the Ceylon cinnamon. When buying cinnamon, It is not always easy, but important to look out for Ceylon Cinnamon, as you rightly refer to on this page. Thanks for that Jacqueline, you are right that it’s important to have the right type.